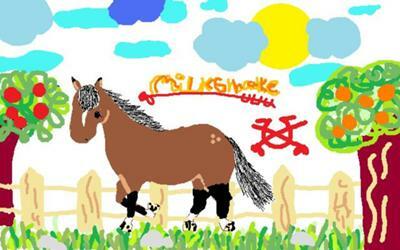 A random picture of a bay horse named Milkshake. Please do NOT copy. So I used Microsoft Paint which you should have to create this lovely picture. Trust me I made it myself without any help. Took about 1 hour. I hope you believe that I made it myself. Please don't copy this drawing/painting, because I'm proud of it and it took me a long time to finish it. If I find out anyone copies it I'll be furious and I'll report it, because copying is not nice and it shouldn't be allowed on great websites like this, so please DO NOT copy this pic. :) Thanks for not copying and enjoy it. I'm sorry but I can't see it. I really like this picture. :) I have to use Photoshop to do anything like that. :) You're pretty darn good if you can actually use just paint to do that. So hopefully no one will use it without asking you...it's very sweet!